"As part of the $10,000 bequest from Cornelius Sweetser and an additional $10,000 raised by townspeople, a parks beautification program was instituted which resulted in the Bandstand, the Common as we know it, and the Rockery. A parks commission was also elected by Town Meeting in 1883 to oversee the project. Now one of Wakefield's most notable landmarks, the Rockery was originally the subject of much ridicule when it was first proposed in 1883 and erected in 1884. The original idea for the grotto-like structure came from Park Commissioner Captain James H. Carter, a neighbor of the site. It was his idea to pile the large rocks into a pyramid, surrounded by ivy, shrubbery and a fountain which cascaded into the basin below. A stately elm tree stood on the Rockery in front of the basin. 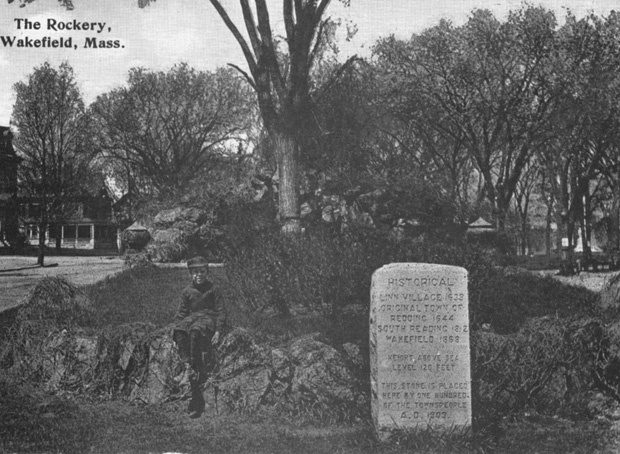 In 1909, the Historical Society and private subscribers erected a tablet at the front of the Rockery, facing the downtown area. This tablet was moved in 1926 when the Rockery was redesigned to accommodate the Hiker Monument and the three stairs which lead to the Spanish War monument. The tablet is now behind the Rockery, facing the upper Common." -- Text from calendar by Jayne M. D'Onofrio. “Wakefield Rockery, circa 1910,” NOBLE Digital Heritage, accessed April 20, 2019, https://digitalheritage.noblenet.org/noble/items/show/7155.